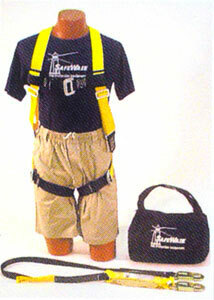 Safety Harness - Quasius Equipment, Inc. Operators of boom lifts are required by OSHA to wear safety harnesses approved by ANSI for aerial lift work. Scissors lifts do not require them. The reasoning is that boom lifts have a catapulting action if they are driven over any slight object. This movement is amplified when the boom is extended so that a 1" "bump" at the wheels can toss an operator out of the bucket. For this reason safety harnesses are required. If you have your own harnesses you can sign off stating this. Otherwise you will be required to rent a harness for the operator(s) when renting any boom lift. Because scissors lifts are vertical lift, and do not have a boom extension, OSHA and ANSI do not require harnesses in them. However, our scissors lifts are provided with harness mounting rings should your plant's safety policy require them.